Free Admission and Open to the Public! Everything's BOGO! Buy one, get one free on thousands of books, gifts, and school supplies. * Refresh your school, home, and classroom libraries, and stock up on books for summer reading. Exclusively for librarians, teachers, district/school employees and volunteers, Book Fair chairpeople, and homeschool teachers, so make sure to spread the word to all your friends! Many of our sales are located in fully functioning, working warehouses, which is not an ideal environment for children. If you plan to bring children, please keep them with you at all times. Like most warehouses, ours do not have extensive climate-control systems, so be sure to dress accordingly for the current season and note that some areas will not be accessible to shoppers. Bring your SUPER SAVINGS PASS with you to the sale, or let the cashier scan your pass from your mobile device or tablet, to save $10 off your purchase of $100 or more. Limit one coupon per person, per visit. 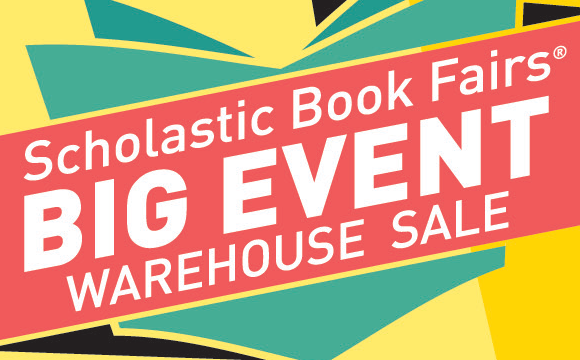 Book fair chairpeople who have Scholastic Dollars to spend at the Warehouse Sale will receive $25 off their purchase of $100 or more! All items purchased with Scholastic Dollars will be sold at the full cover/stickered price and do not qualify for buy one, get one free. Sales tax charged if applicable. Limit one coupon per person, per visit. Additional details will be provided when you register. Credit cards, checks, purchase orders, and Scholastic Dollars™. Title I and grants are welcome! If using a Purchase Order, bring a copy of it with you. PO terms are net 45. Tax-exempt schools must bring a copy of tax-exempt documentation.